You have been out for a run. Jogging was part of your life, and you know what benefits these exercises. But over time, I want something new about, for example, to run a greater distance in the same time. In short, you want to run faster. What to do to improve speed endurance? Before you begin to exercise on the development of speed, make sure your sneakers match the new demands. The higher the speed you run, the more shock load on the joints and spine. Now your shoes should have cushioning camera not only under the heel, but under the front part of the foot. It is not necessary to increase the speed of running, trying to artificially lengthen the step. You'll just bounce while running. The step size depends primarily on the strength of ejection. Be sure to add in warm-up stretching exercises. Sometimes make a quick escape hampered by insufficient stretching of the flexors and extensors of the thighs. Place your feet on the width of the step, right front, left rear. The right foot looks right, foot left leg deployed at a right angle to the direction of movement. Right knee bent. Grasp right thigh with your hands and pull the body to the right leg. Slowly shift your weight to the left leg and bend it at the knee. Repeat for the other leg. Sit on the edge of a chair the right thigh. Left leg can digitise freely. Grab hold of your left ankle and pull heel to buttocks. Keep your backs straight. For stability stick to the right hand of the chair. Repeat for the other leg. Another mistake, which is not evident at slow running, but immediately catches the eye when you start to run faster. It is a wrong use of your arms and the enslavement of the body. If your shoulders are tense, when running the whole body will unfold to the sides. Consequently, the translational motion of the entire body is replaced by a forward rocking of the body. Stand in front of the mirror. Shoulders relaxed. Bend your elbows at a right angle. Do not squeeze fingers in fists. Tension in the hands is passed around shoulder belt. Imagine that the fingers you are holding butterflies. Start slowly to work with your hands. Hold the angle in which the bent elbows. Monitor in the mirror, shoulders and whole upper body was motionless. Gradually increase the pace and intensity of work by hand. To increase the thrust force when running, you need to perform exercises on equipment is running with high lifting hips and running with the zahlest Shin. These exercises we've all performed in school physical education classes. It's time to remember them and do well. Thigh lift high, to waist level. Keep your backs straight. The hands work with stress. When running with zahlest Shin try to hit the heels on the buttocks. The body slightly tilted forward, the work is very intense. For maximum effect, perform these exercises directly while Jogging. For example, perform running with high lifting hips for 1-2 minutes, then 5 minute run quietly to catch my breath. Run Jogging exercise – running zahlest of the tibia, and a quiet run. Such sets need to make 6 – 8. Another exercise which helps to develop push, it exits with a jump. Stand facing the step platform or bench. Step left foot up and push off the right leg. At the same time the left foot push off from the platform and take a jump. The right leg should bend at the knee and rise to the height of the hip. Land with both feet on the platform, then get down on the ground, right foot first, then left. Actively help yourself with the hands. Complete 15 – 20 approaches, and then change legs. Include in your training of interval running. During interval running, you can vary the speed from medium to very fast. For example, 3 – 4 minutes, run really fast, then move on to slow Jogging for 7 – 8 minutes. The cycles repeat several times. Increase the time running fast. 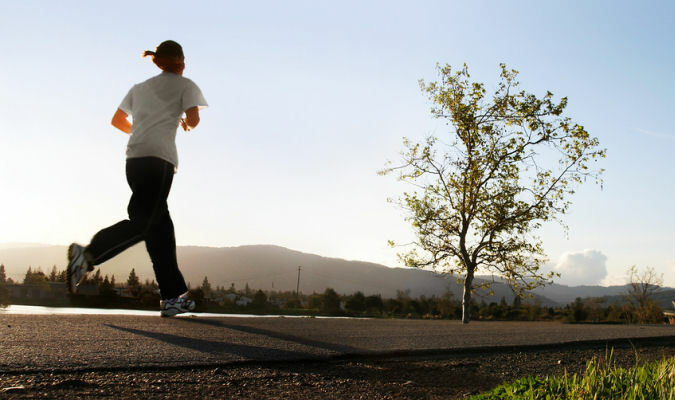 Gradually your speed endurance will increase and you will be able to run at a fast pace.